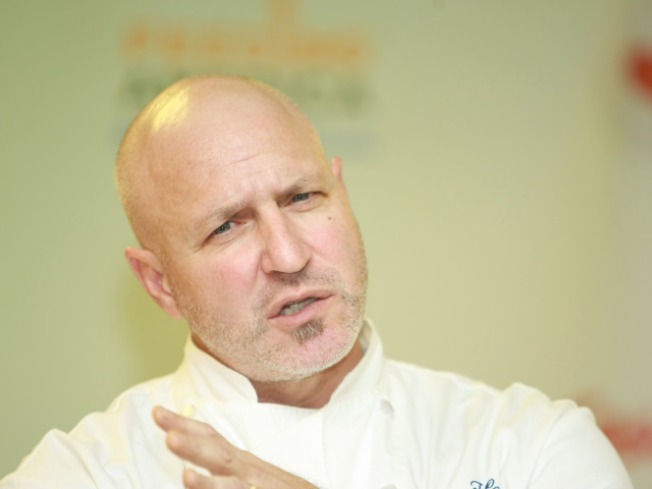 Top Chef's Tom Colicchio is one tough judge. The final three are taken to the Getty Villa, a beautiful mansion, and Kelly fills them in on their final challenge. They will need to create a series of dishes the represents their history as chefs. The first dish should be inspired by their first food memory. The second dish should be inspired by the experience that caused them to become chefs. The opening of their first restaurants should inspire the third dish. And the fourth dish should represent where they will head in the future. It's a really, really awesome challenge, so hats off to the producers. They will be judged by the traditional three critics, but also by Colicchio, Padma, and Gail, as well as the five winners of the past seasons of Top Chef. The twist this week is that each chef is joined by a sous-chef from his restaurant to help him. The food that the three chefs put out on the table is really amazing, and I'm super jealous of the people who got to eat it. Even the dishes that were a bit less than successful were good and the diners have trouble finding things that were wrong with each. In the end, Rick Bayless edges out Michael Chiarello and Hubert Keller to win the title of Top Chef Master and a $100,000 donation for his charity.